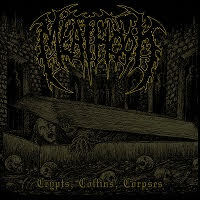 As a big Lord of the Rings fan, I appreciated the intro to the first track on MEATHOOK’s third full-length album, “Crypts, Coffins, Corpses”. Hailing from Arizona, MEATHOOK play a brand that I associate with Texan bands like VIRAL LOAD and PROPHECY. Other than the LotR introduction, my first impressions are that this band knows how to write Brutal Death Metal that grooves hard, especially on the first track, “Awaiting Torment”. MEATHOOK play Brutal Death Metal that you might hear from the late 1990s or early 2000s. There isn’t any slam influence, but there is a lot of SEPSISM, SEVERE TORTURE, and VIRAL LOAD influence. It’s that groovy, fast, blurred brand of brutality that made the late 1990s so great for the scene. “Awakened by the Stench” is a good example of this. Every song is around the three-minute mark, and the riffs are fast and tremolo picked. The same groove is experienced later on in “Placed Upon the Altar”. The song has a crushingly heavy chug intertwined with groovy passages. What really makes this band groovy are the drums. I feel like the drums are usually overlooked when it comes to credit, but whenever there’s groove in music, it’s usually made noticeable because of the drummer. This album is a perfect example because the drums on here highlight the groove with exact precision. When MEATHOOK aren’t blasting away and tremolo picking, they’re creating dissonant passages as seen briefly on “Purification through Pain” and the title track. I love when Brutal Death Metal plays with dissonant chords like that because it’s really some of the only differentiation among all of the brutality. There are other ways to execute that, but dissonance is my favorite because the two themes – brutality and dissonance – just fit so well together. Riff-wise, MEATHOOK excel. Not only that, but the drums are also good. They aren’t amazing, but they do their part well, and the music definitely benefits from it. As for vocals, they are gnarly and disgusting in the best of ways. They sound like the Cookie Monster being chewed up by a woodchipper, and it’s awesome. The musicianship on this album is great, and so are the vocals, but what about everything else? I think that the structure of the album is pretty good. Everything seems pretty balanced, not having the best songs crammed together on one end. Everything sounds good from a production standpoint. Originality isn’t really something that exists within this genre anymore, but MEATHOOK are memorable, heavy, and write good riffs, so they don’t need to worry about that. Overall, I think this album will definitely be on a lot of “top (x) albums of the year” come December of 2019. I can’t say that for sure, but it’ll definitely be an album I consider for the list. MEATHOOK made a massively heavy album, and that’s a fact.